Sikh and Punjabi cultures have an apparent influence on Delhi, and it can be very well seen in the city’s food, language as well as architecture. Therefore, finding a considerable number of Sikh pilgrimages/places of worship in Delhi is also foreseeable. Although one can find a Gurudwara or Sikh worship place on almost every nook and cranny of the city, there are ten top pilgrimages that have historical significance attached to them. Amongst the most visited Sikh pilgrimage sites in Delhi is Bangla Sahib Gurudwara, situated close to Connaught Place. 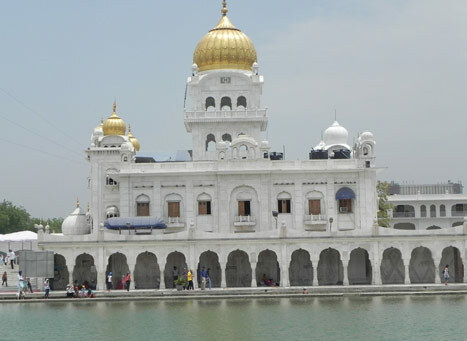 This golden dome Gurudwara is quite popular amongst visitors of different faiths and comprises the main worship place, a Sarovar/pond, the Yatri Niwas (guest house), an art gallery, a hospital, museum as well as a school. Named after the 8th Sikh Guru, Guru Harkishan Sahib, Bangla Sahib is the most important Sikh pilgrimage site in Delhi. In one of the alleys of Chandni Chowk, stands another imposing Sikh place of worship, Sis Ganj Sahib which is dedicated to the 9th Sikh Guru, Guru Teg Bahadur. Standing as a memory for the righteous cause of the freedom to choose one’s own religion, Sis Ganj Sahib is where devotees come to see the trunk of the tree where Guru Teg Bahadur was executed. Another prominent Gurudwara in Delhi is Rakab Ganj near the Parliament which is reckoned to be the cremation ground of Guru Teg Bahadur. Other important Sikh pilgrimage sites in Delhi are Gurudwara Banda Bahadur in Mehrauli; Gurudwara Mata Sundari behind the Maulana Azad Medical College; Gurudwara Moti Bagh on MG Road; Gurudwara Bala Sahib opposite Maharani Bagh Colony; Gurudwara Damdama Sahib near Aurangzeb’s tomb; Gurudwara Majnu Tilla opposite Timarpur; and Gurudwara Nanak Piao at GT Road, which is said to have been visited by Guru Nanak himself.